Search, book and pay for London conference venues. Take a look at our top picks for conference venues to hire in London. Need a ballroom to hire in London for your next showstopping event? Welcome to the Hotel Cafe Royal, Pompadour Ballroom. Looking for a quirky meeting venue to hire in London? Look no further than Bounce in Camden as a unique meeting room! CentrEd at ExCeL is a state-of-the-art meeting and training facility, ideally situated, with panoramic waterside views across London. For a conference room to hire in London look no further than the Guy Whittle Auditorium at 1 Wimpole Street. The Great Briton is a space that references the British champions of London 2012 as well as those remarkable West Ham United players and managers who earned a major winners medal. Welcome to the Main Hall at The Steel Yard, one of the most historic venue hires London has to offer. Battersea Evolution is a spectacular London venue to hire for large-scale private parties, business conferences, gala dinners and exhibitions. Edwardian I is the largest indoor event room at St James' Court, A Taj Hotel. Hire the Great Hall at the BMA House for one of the best options for conference venue hire London has to offer. Perfect for a wide range of different events. ODEON Leicester Square is an ideal screening room hire in central London. The Prince Albert Suite at the ZSL London Zoo is one of the best options for venue hire London has to offer. Exclusively hire the entire venue at Vue Leicester Square for your next cinema hire in London. The Sandbox is Level39's events facility. Flexible and creative, The Sandbox is designed to facilitate the best-in-class tech events situated in the heart of London's Canary Wharf. With a blank canvas design, this versatile cutting edge space is perfect for private meetings, workshops and training days. Illuminate at the Science Museum is a progressive new venue designed to both anticipate and surpass the needs of the ever-evolving events industry. The Weston Theatre is a purpose built lecture theatre providing a high spec venue for presentations and conferences. Hire Flight at the Science Museum - an iconic and unique venue to hire in the city that'll be a sure way to impress your guests. When it comes to planning a conference, you need to find a venue that suits your audience, in the right location, with the right facilities. Whether it’s a small and quirky Space you're after, or one of London's largest and most iconic, we've got you covered. Start your search with our top 20 conference venues so that when it come to planning your event, the venue will be one less thing you have to worry about. Finding conference venues in London can be daunting. You’ve got a list of criteria to meet, details to finalise and endless requests for hard-to-find facilities. Can you really find a venue that ticks all the boxes? Whether you need modern conference venues in central London for an all-company conference for one thousand people or you want to impress your Guests with a more unusual conference venue in the city. Even better, if you’re on a budget you can negotiate a Bespoke Package directly with the venue Host to get the best venue hire deal for you. Treat your Guests to a show-stopping conference venue in London that will keep them inspired. With HeadBox you can search, book and pay for venues all in one place. From modern, large or cheap conference venues we’ll be sure to find the right Space for you. Need a hand planning your next corporate event? We have an Account Management service for corporate event bookers. Trying to plan a conference in London is a huge task. 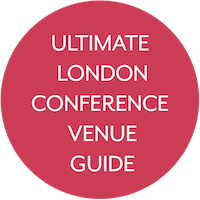 There are lots of things to consider and an even longer list of things to action so we’ve created a checklist guide of the most important to give you a little helping hand when planning a conference in London. Before you start planning a conference it’s important to understand why you are putting on a conference. Focusing on the ‘why’ means you’ll be producing a meaningful and impactful event for your attendees. As with any event, always keep the budget in mind, especially when it comes to hiring a conference venue in London. There’s lots of things to think about from AV to catering, and ticket apps to staffing so make sure you have a strict budget plan and work out how much you want to spend on each component of the event. It’s always wise to keep a little extra budget available for any last minute costs, such as cleaning fees or late collection if you’re using a furniture or technology company. Be sure to run through the T&Cs for all suppliers and the venue so that you understand what you may be charged for. This may be something that you wish to negotiate so having all of the facts in the early stages of planning is important. When planning a large scale conference, giving your attendees as much notice as possible is key so we’d recommend diarising the date at least 6 months in advance. Make sure you have a list of the key attendees and provide them with two or three alternative dates to choose from. Once the date has been chosen by this group, make sure you send out a save the date so that you can continue planning the event safe in the knowledge that you will have attendees. Until the date is confirmed, we’d suggest asking the venue to put a hold on the potential dates while you’re confirming the final choice. By doing so, you won’t have to worry about losing the best date for the event. Most venues are very happy to hold multiple dates for a short period of time, but it’s always best to check this as every Space is different. There are many different styles of conferences you can organise. Do you want a quirky conference or a more traditional one? Whether it’s an unusual conference venue in Shoreditch or a traditional venue in central London there are many benefits of both of these styles. A quirky conference venue allows you to leave your own personal stamp on the event, hiring a blank canvas means you can completely transform the Space to fit your brand. The quirky and unusual venues are also great for making your conference stand out from the crowd so why pick a venue that’s completely different from anything you’ve ever used before. If you’d like to keep things a little more traditional than there are lots of positive reasons to hire a more conventional conference Space, especially if this is a corporate event. Picking a venue that’s primarily used as a conference Space will also give you the added benefit of having a dedicated events team, which is always an event planning bonus. There could be a very long list of suppliers that you will need to work with to make sure your conference is a huge success, but more often than not there are four key suppliers that every conference needs. These are staffing solutions, AV providers, furniture hire and catering. So make sure, as part of your event planning process, your suppliers are considered and carefully selected. Organising an event with a lot of attendees requires serious discipline around attendee registration and management. You want to know exactly who was at the event and what they engaged with while they were there. We’re all about technology at HeadBox which is why we’d recommend finding a digital solution, which can be accessed by all members of your team via an app or desktop when you’re at the event. The most common way to manage attendees in a situation like this is scanning e-tickets using an app on the door. Getting feedback from both attendees and staff who attended your conference is the key to any successful event. Try to get feedback during the event as well as the next day so you can get both live and reflective feedback from everyone. A pretty simple way of doing this is by sending out digital feedback forms to the registered email addresses of all your attendees. Sending digital forms are a much more efficient method as it will only take your Guests a few minutes to fill out and can be done from their phone, laptop or tablet. The easier you make this for your attendees, the more insight you will receive. We hope you’ve enjoyed our handy HeadBox guide on all the things to consider when planning a conference. Now go find that perfect conference venue to hire in London and get started! We can’t wait to hear all about it. Quick, efficient and very friendly. All of the queries and issues that I had were sorted completely within a few hours. Will definitely be going back to them. HeadBox is now my go-to website for booking meeting rooms. My clients have been really impressed with some of the fantastic spaces I’ve booked through HeadBox. HeadBox has some of the best options out there for venue hire London has to offer! I was amazed at the amount of options they had for my event. I highly recommend using HeadBox when it comes to researching and booking a perfect event or meeting space! As an assistant, I have been tasked with booking spaces in so many cities I haven't visited and wish I found this website sooner. Everyone I have communicated with has been so helpful, thorough and friendly and they are fabulous with helping to narrow down what you need. Such a time saver for anyone needing to find the perfect venue! The HeadBox concierge team were all extremely friendly and were helpful with any questions I had. I would definitely recommend HeadBox to others! Couldn't praise the team at Headbox enough. Efficient, professional and incredibly personable. Will certainly be using their services again.